Martin Truex Jr.’s win at Pocono three weeks ago served notice that this year’s points race might be more than a two-man showdown between Kyle Busch and Kevin Harvick. Now NASCAR’s defending champion is back at Sonoma Raceway, where he’s had plenty of success. Truex won at Sonoma in 2013 and led several laps of last year’s road race before engine trouble sidelined him with a disappointing finish. 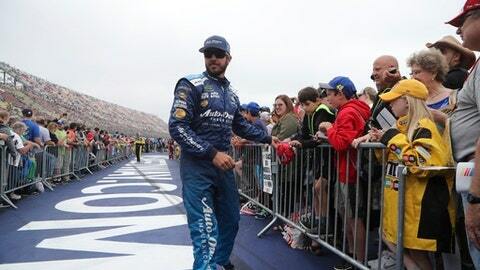 The 37-year-old is one who enjoys switching to road courses – as opposed to the usual steady diet of ovals – and hopes it can help him vault closer to Busch and Harvick in the points standings. Truex is currently sixth in the standings, just behind Brad Keselowski and Clint Bowyer. He’s already qualified for the playoffs because of his two victories, so now his team’s trying to figure out how to be more consistent. Truex said he doesn’t expect Busch or Harvick to be any less successful at Sonoma because of the switch to a road course. The two have combined to win nine of 15 races so far this season. Truex said he feels his team isn’t far off from where it was last season, when he won eight races and captured his first championship. He praised both Busch and Harvick for great seasons and said his team’s working to figure out how to match them. ”We’re off a tick from where we were and those guys are just a tick better,” Truex said. Truex hopes being back at Sonoma – and remembering how good his car was last year before the engine trouble – can be a spark to push his team forward. ”We had a really good shot at winning last year and it really stung for us,” Truex said.